There are countless times in our lives when we are involved in some negotiation: purchasing something (car, furniture, etc. ), asking someone on a date, and, of course, when buying a home. In these times, we hope to gain the upper hand — either because we want to save money, protect our pride, or otherwise achieve the desired result. 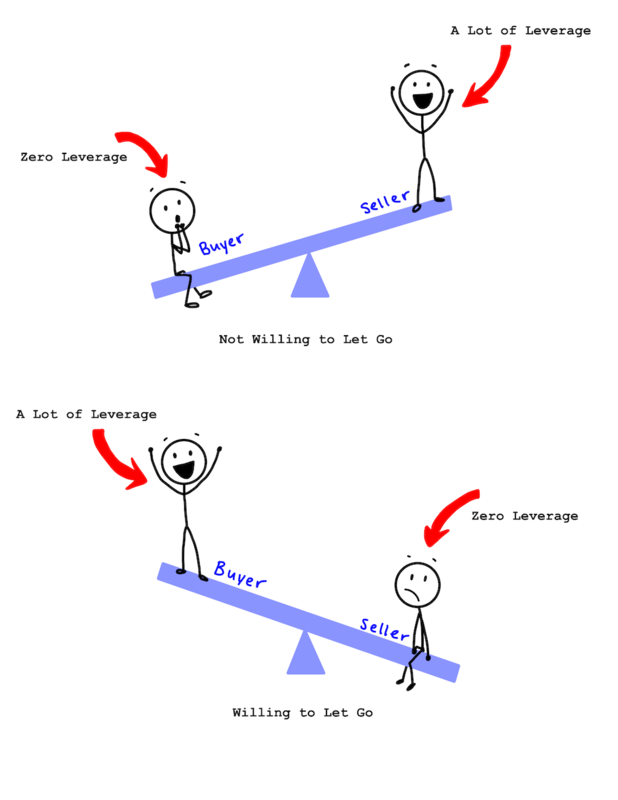 In my experience, the more we are willing to let go of the outcome, the more leverage we gain. Sometimes this is easy, but sometimes it’s difficult and even complicated. And without the requisite information/understanding, we may be lost entirely and not know how much risk to take (or not take). I had a few girlfriends growing up, and even managed a few dates, but until I met my wife I didn’t have a real interest in any one girl. The moment (and I mean the moment) I saw my now wife, I lost all leverage. She was unaware of just how sophisticated and unpretentious she was, she was kind, and the most beautiful girl I’d ever seen. I used to run a lot in those days, and I remember running through neighborhoods imagining that this house, or maybe that one, could be where we live. I tried to feign indifference (even after she very nicely turned down my date request), but the truth was I had zero leverage. I knew a similar girl didn’t exist. If I wanted to spend my life with this girl I needed to make like Cortés and metaphorically burn my ships. As we work with buyers, we get to know and understand what they want in a home. We eventually discover what they can/can’t live without. Knowing what the buyer wants is a vital step because, when the time comes to write an offer, one of our most important jobs is to help them understand how rare (or common) the property may be. If there is a good chance a similar property will come along soon, the buyer will have a bit more leverage in their negotiation — because it will be a bit easier to walk away if their offer isn’t accepted. But if it’s the property version of my now wife, the buyer needs to know how much they have to lose; they need to know a similar property may not come along for a long time (or ever). How the buyer decides to proceed from here is immaterial to us, but we deeply care that the buyer has the right information on which to base the risks they take.